"I started at St Ives branch straight from school in 1993; I then moved up to assistant manager, then became branch manager at our Royston branch for three or four years. 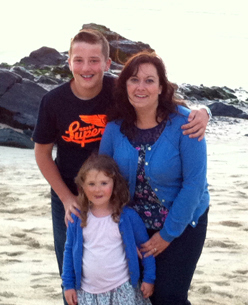 After I had children, I moved back to St Ives as branch manager, where I've been for the last 20 years. I love the challenges of working in travel, the job variety, the fulfilment of creating dream holidays, helping to develop my staff as a manager and learning something different every day about countries and places to visit on my own holidays." "Thailand, California, New Orleans & the Deep South (USA), Indonesia, Bali, Mauritius,Caribbean, The Maldives, Dubai, Bahrain, all of the Canaries and Balearic Islands, Cyprus,Greece, Turkey, I've cruised around Madeira and the Canary islands, as well as to Belgium and Amsterdam." "New York – I've wanted to go for years! Mainly to see the sights like the Empire State and Statue of Liberty in person. I'd also love to go to South Africa for the amazing wildlife and game drives, once my children have grown up!" "Mauritius – the experience of going on a submarine was incredible, it's a really friendly island full of beautiful scenery and I have really fond memories of being there." "Bali – I had my honeymoon there and the whole country is beautiful. The rice fields in Ubud are stunning – I'll never forget that!" "Nothing's too much trouble - I always offer the very best customer service, I'll remember clients' names and details from past holidays, as well as things like their family history and where they like to go." "Split your luggage when travelling as a family, this divides the weight and then you've all got something of each other's in your case in case there's ever a problem or delay." "Your camera – it's important to capture every precious moment of your trip!"